Dense clusters of flowers bloom in spring and summer and are great companions for Bleeding Hearts, Hostas, Hellebores. 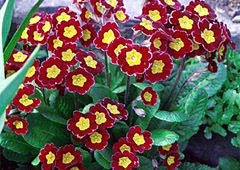 These Primrose hybrids come in many bright colors and bicolors and make great bedding plants. Flowers appear in every color except green. Bicolors are common. Foliage continues to grow into a low rosette after blooming. Flowers appear in dense clusters on a strong, hairy stalk. not native to North America - Hybrid with parents from Europe, Asia, Middle East and Russia. Propagate by seed, division or separation - Can be divided after flowering in the spring. Seed germinates best when fresh. Doesn't need frequent division. Divide in early spring. Winter mulch is helpful where snow cover is minimal. 'Pacific Giant' shades of blue, yellow, pink, white. 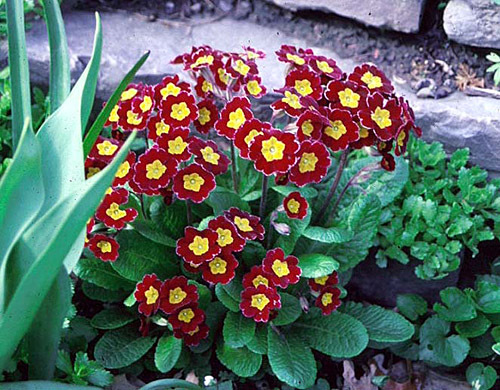 Large flowers, often with contrasting "eyes."